Aurora is a sweet and pure angel who helps people to become spiritual teachers and leaders. She has very high vibrations. Her mission is to raise your frequency and fill your heart and mind with high angelic sapience or wisdom. 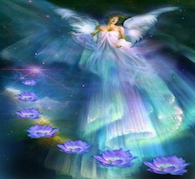 Angel Aurora may work with you during sleep or when you meditate. She can lead you to spiritual books that are perfect for your needs. The Angel Aurora attunement gives you a permanent link with this beautiful angel and her vibration. It is very useful for Reiki and spiritual teachers and also for spiritual healers.